People living with HIV could soon monitor their own condition at home using a hand-held device, similar to ones used by diabetics . 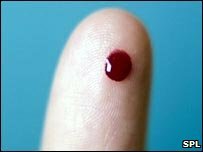 Scientists at three of London's largest research centres have been granted £2m to develop a hi-tech, finger prick blood-testing gadget. The device's tiny mechanical sensors - microcantilever arrays - measure HIV levels to warn of impending flare ups. A display then alerts the user if there is any need for them to visit a doctor. Investigator Dr Anna-Maria Goretti, an NHS consultant and co-investigator based at the Royal Free Hospital, said: "If patients neglect to take their treatments or need prompting to see their GP the device will provide a simple way of letting them know. "It will really empower HIV patients to keep a close eye on their health and their treatments." Instead of routinely seeing a specialist every three or so months "just in case", they would only need to see their doctor when things were going wrong. As well as reducing visits to the doctor, it could also be of real benefit in developing countries where rapid and affordable ways to monitor HIV patients are urgently needed, say the researchers. The microcantilever arrays are each coated with substances that stick to the HIV and other proteins, which are markers associated with disease progression. Accommodating these markers causes the highly-sensitive sensors to bend like a diving board and this bend indicates the level of virus in the body, explained lead investigator Dr Rachel McKendry of University College London and the London Centre for Nanotechnology. "We have used microcantilever arrays to investigate drug resistance in superbugs such as MRSA, and are excited by the opportunity to extend this approach to detecting HIV markers," she said. Dr McKendry is working with Imperial College London, Cambridge Medical Innovations, Sphere Medical Ltd and BionanoConsulting on the three-year project to develop the prototype hand-held device for clinical trials. Lisa Power of the Terrence Higgins Trust said: "This is certainly a very good idea. If you have diabetes you can check your blood sugar levels. "Similarly, it would be very useful if HIV patients could check their own viral measures, say, once a month." "It would not replace specialist advice, but it would be a way to reduce a patient's dependence on doctors."